I had my second dive (Aquarium, Depth 6m) and Bill joined in. This time we dove outside the pass (yes, in the ocean). There were more fish, sharks and coral. The reef is fairly damaged there, so you can see it's shape. It's like a long sloping ridge, that undulates and curves like the Cascade Mountains (only way smaller). Thursday, Wash, Rinse, RepeatI dove twice again the next morning (Moorea Crater, 12m), Bill came along for one dive. The conditions were more calm and there was yet more coral, fish, sharks, etc. The dive boat had American (me) and Italian clients, and the French instructors. They seem to know all the necessary languages. Photo left to right: A mexican diver, Tomas an instructor, Laurent, an instructor and gendarme we met the day before when he came around the anchorage to remind everybody our stay is limited to 7 days. Afterwards we dinghied over to Cooks Bay, bought some fish and two jugs of diesel and explored. We went to the NW corner of Moorea (Taotoi, 18m) outside the reef into Shark Soup. Bill counted 19 sharks! The dive masters seem to know them all. Some get petted. One was preggers too. Wowie! Holy Moly! Cowabunga! There were also Moray eels. One wasn't too shy and came out of his hole to menace us. A real highlight was feeding a hawksbill turtle. We've got great underwater pictures and video. Will post soon. Then we went back to our boat to warm up and eat lunch and cram for the final that afternoon. We managed to pass the written test, and despite botching some of the in the water dive skills, we passed. That was a relief. We're looking forward to spending yet mo'money and enjoying the underwater attractions here in the Society Islands, Tonga and eventually Fiji. After a week of lovely sunny, breezy weather, the torrential tropical downpours returned. Yay! More free fresh water!! Last Friday afternoon, we moved to next door to Cooks Bay. You have to exit the pass in the reef out in the ocean and enter at the next pass. The sea outside was unexpectedly rough, so it was a wet trip. We were towing the dinghy with the outboard on it (again), but we managed not to flip it (again). The outer anchorage was really windy, so we moved deeper into the bay. We had only planned to go out to dinner and leave Monday morning for Tahiti. However, the weather continued very rough and windy in the region, so we stayed on. We went out for one of the better dinners we've had for a long time. What a treat. After dinner, we walked a mile or so back to the dinghy. It was after dark of course. But the road was very well lit and there was practically no traffic. It was a pleasant walk, and we feel very safe. People are very friendly and easy going and we always feel at ease. Biking is very pleasant here, as the roads are pretty good, traffic is light and doesn't go very fast. There are few hills and the scenery is beautiful and the air is balmy, not too hot. It's a great way to get around. We explored and found more businesses here than Opunohu Bay, with good grocery stores, a great pastry and ice cream shop, a pretty good electronics shop, hardware, building materials, clothing and the ubiquitous black pearl shops. The local fishermen sell fish along side the road. They have a rack that they can hang a couple rows of whole fish from. There are also fruit and vegetable stands. And, Gasp! a gas and marine fuel station, with a small boat dock! We haven't seen one of those since.... Mexico????! We still got diesel in 5gal jugs via the dinghy, The water at the dock doesn't seem deep enough for our boat. There are several good restaurants, including more than one that serves pizza. Life is good! In all the pictures you don't imagine all the actual sounds. Of course, there's the soft sound of distant surf on the reef. And the wind ruffling the palms and waves lapping on the sand. There's the sound of wind in the rig, wave lapping against the hull and sometimes the sound of fish jumping or splashing. On shore, you hear the birds in the trees sometimes. There aren't many seabirds and they don't make much sound..
On the boat we usually have the VHF radio on, so sometimes you hear the neighboring boats hailing each other. Sometimes, Mahina Radio, Tahiti's coast guard radio announces weather, boats in trouble or snotices of special events (manifastions) like the Rendezvous. There are the engine sounds of passing dinghies, motor boats and jetskis. This part of Moorea's lagoon is a protected environmental area, the jetskis don't play around the anchorage. However, there are jetski tours. So a couple times a day, a line of 4-6 jetskis pass through. These islands are mountainous, so settlement and roads are on the shore. So there's the ocasional sound of a passing car, truck or scooter. Near our anchorage, somebody runs a disco in their home or yard on Saturday and Sunday nights. They play sort of techno-lite. Of course they have a nightclub quality sounds system. It starts in the afternoon and runs until...3am, 4am, or 5am in the morning. Ugh. Under water you hear the constant sound of your own breathing through the regulator. On a calm day, when I come to the surface, it sounds so quiet, until someone speaks or an engine starts up. The sounds you might not expect are constant crowing roosters. There are chickens everywhere. Also, the sounds of barking dogs. There's a huge overpopulation of dogs in the Tuamotus and Society Islands. A few stray dogs live in the park at the anchorage. During the day, they're quiet and docile. At night, it sounds like another pack of dogs comes around and there's lots of barking and fights. You can hear the smaller park dog yelping. In Cooks Bay, there's a big dog that starts barking in the evening. Later some of his neighbors join in. Sometimes, it sounds like a pack of dogs comes around and they all start in. It makes you wish for the disco instead. At the kitchen store in Papeete, on impulse I bought a couple decorative china cups and saucers that were on sale. Behan Gifford on Totem from Seattle came by for tea. We had tea (in a teapot) on a tray, sugar lumps and canned cream from Mexico. (There's great cream in the stores here, I should buy that and toss out the Mexican stuff.) It was a change from the mugs or insulated car mugs we normally use, and a reminder of "gracious living" back home. Behan remarked that the blue and white shell motif on the cups looked like the tile trim SYC ladies rooms. Actually, they match a plate I bought in Friday Harbor, which of course, is in storage. As the fleet gradually filtered away, we were drying the boat out and I was feeling better. The gendarmes dropped by to remind us that we were only allowed to stay a week in the anchorage. They were quite nice. Several seemed to be newbies that spent all their time looking over the side of their boat at the clear waters below us. We dinghied our bikes to the beach, assembled them and biked around Opunohu Bay to explore. Biking was nice on a quiet two lane road. Kids were coming home from school and laughed at our funny bikes. Bill had been interested in continuing his dive certification. Andrew from Mulan had signed up for classes with a local shop, so we signed on too. Bill had started his course in Mexico, so I had to catch up by taking the debutant (beginner) classes on my own. The next day, I had my first dive class since 1975! Omigod! They strapped on what felt like 100lbs of armor. They had to help me stand up and walk backwards with my fins on to the edge of the boat where I was supposed to fall off backwards. I was terrified! I later figured out why they had us put our fins on first before donning the rest of the gear. If you bent over to put on your fins with all that stuff on your back, you'd fall over on and smash your face on the deck. Anyhow, Nicolas, my instructor, was so kind. After I floundered and huffed and puffed for awhile, he calmed me down. It seemed to take lots of force to breath via the regulator (mouthpiece). I knew I wasn't going to die, because I had survived this insanity in the cold dark waters of Puget Sound. But still, I ain't as young as I used to be. Nicolas led me around by the hand for the next several dives, even when Bill was along.. We worked with several French dive instructors and they were all really professional. Also, the French training regime is much more "by the book" than the Mexican courses were that Bill took. 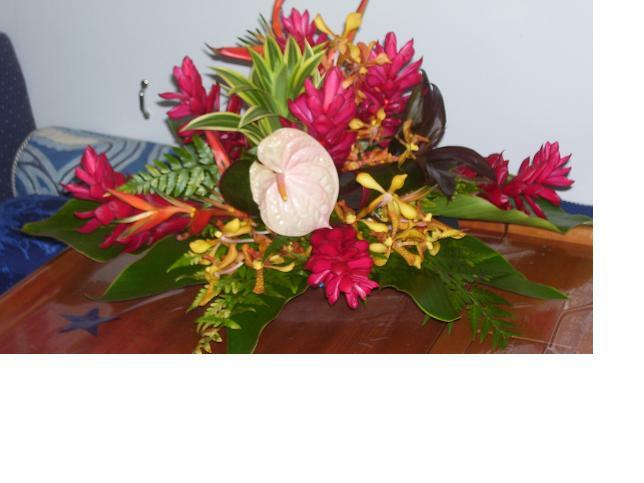 Saturday, June 19th, Papeete, our 11th wedding anniversary. 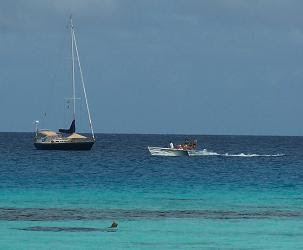 We started the sail ("not a race") to Moorea Saturday morning. It was warm and breezy leaving the pass from Papeete harbor. Brian on Further (from Seattle) was the committee boat and a well organized and timed start was made (but it's not a race). Beyond the wind shadow of the island, the wind and seas really picked up. It was a boisterous 10 mile reach. We had a good start and were in the front row most of the way with some cats. We managed to hold of Delos until the end when they discovered that lowering the mizzen gave them boat speed. They passed to leeward and tacked to finish between the entrance bouys at the pass to Opunohu Bay. We took their stern. Someone remarked later that if it had been a phrf race, we would have won. We finished eighth, but it wasn't a race. 30-40 boats crowded into the beautiful anchorage in front of a small beachfront park. Big tents were set up for entertainment and dinner. (Good thing, becaused it rained cats and dogs the next day). We had a BBQ dinner and went back to the boat. I was not feeling tip top. Sunday, June 20th , Moorea, a tropical deluge. There were games and outrigger canoe races. Bill's team, including Jaimie GIfford, distinguished themselves by capsizing the canoe a couple times before the start. The next team to use it capsized it right at the launch. Anyhow, they came in 2nd. There was a special authentic Tahiitan lunch. I spent most of the day on the boat, near the little room. So when I came ashore for lunch, my appetite was not good. Sad to say, we didn't really take to the Tahitian dishes that were served. There were several speakers. One speaker was a wiry Tahitin named Thierry, a local fish expert and guide. He remonstrated us not to feed the fish. We can lead them around with fish food in containers, but do not feed them! And don't throw food overboard. The water here is so clear, it seems terrible to toss anything overboard. Thierry says he's contracted Ciquaterra 14 times! Yikes! We spent a few delightful days in the south end of Fakarava atoll, which is rightfully renowned for its fantastic underwater life. Snorkellers can drift on the (incoming) tide, via the pass through the enclosing reef, over the luxurious coral and other aquatic life. There are all kinds of fish. And, all kinds of sharks. I don't mind the big lazy ones snoozing on the bottom. But the busy hunting ones, small and large I'm "a'skeered" of. The water level on reaches a few feet above the coral, so it can be unnerving whilst you are paddling along, minding your own business, that a good sized (and well fed looking) shark cruises by in the nearby shallows. There's a small resort there that has docks over the coral filled water. The sharks are buzzing around there too, so you don't dangle your toes over the edge of the dock! Most of the sharks are not very big, maybe 3-4 ft, but that's plenty big enough to take a bite! We stopped at one small reef to snorkel and a couple beautiful, though aggressive ones went whizzing around the dinghy. We moved on. We are currently sailing along, broad reaching, the 250mi route to the island of Tahiti. The seas have been very calm, and the wind is moderate, so it's one of our easiest passages so far. The sun sets promptly here at around 5:30. We have a new moon now and the ambient light is dim enough you can see the dark side of the moon setting on the horizon. The stars are glorious and the milky way is really milky. We can still see the Big Dipper to the north, but Orion and Cassiopia is long gone. There are several other boats in the area also headed to Tahiti, so we really gotta stay awake at night to be sure not to run into them. At most anchorages, there are other boats we know from Mexico. The weather is warm (and not too humid) during the day and our dark painted boat gets really hot inside. Yuk! Night time is much cooler and more comfortable. Although we don't get much done, because one of us always needs to get their sleep. We expect to arrive in Papeete tomorrow. There has been a strike of government workers (how French!) that interfered with their weather reporting! Fortunately, we can get US, Fiji and New Zealand forecasts. But the strike has ended so, life can go on. Well, it's almost dinner time. I gotta figger out what combinations of delicious canned foods to open tonight. Sigh... Fresh veggies are just a day away. Paumotu are the people of the Tuamotus. 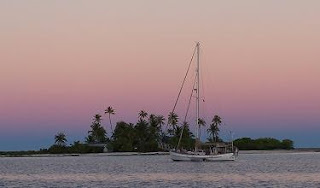 After an uneventful 515mi sail from Nuku Hiva to Makemo, we spent an uneventful week in the Makemo atoll. There's several hundred people there in a well kept village. However, there is a huge overpopulation of dogs, and it's a tragic situation. It was overcast and showery up to today, so we didn't do much snorkelling. However, exiting through the little known NW pass in bright midday sun, we could see the dazzling coral garden below. We spent the last two days slowly and painstakingly slow motoring from one end of the atoll to the other. There are many coral heads and pearl farm strings, so great care, low speed and constant bow watch is required. We made it without incident. We didn't see another soul for days, and very few structures. We really felt far away from everything. However, once you get out on the sea and can see several other atolls around, even though we haven't seen any other boats, we get the sense there are people around, somewhere. The sun set tonight at 5pm. We're en route motoring to Fakarava in the calmest seas since Puget Sound. We expect to arrive early tomorrow morning. This last week, we saw the most rain since Puget Sound. It was great, though. We collected lots of rainwater to use lavishly for washing.